HometrinityWHO IS GOD, JESUS AND THE HOLY GHOST? 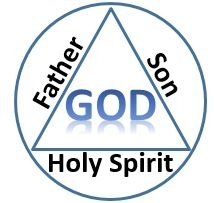 This is fondly called the Trinity in the three persons in one God: God the father, son and the Holy Ghost. This is a mystery but can best be understood by those who are of God through faith in Jesus Christ. For God did not leave us in ignorance of his Godhead but have made it known to us by our nature so that we have no excuse (Rom 1:20). That we are also made in his image in Trinity – Spirit, soul and flesh. (1 Thess 5:23). Even so, God is three persons in one God father (Heb 12:9); Holy Ghost (1 Cor 6:19, Heb 10:38), and son (John 1:14). Blessings: The knowledge of this mystery will bless your life and improve your relationship with God very well. You need to know him so that you can have faith in him. To know God in all his total dimensions will endear you to him. Give you the assurance that you are dealing with a personality of no mean nature. It will help you to do exploits for the kingdom of God. When you know the trinity of God, it will help you to be balanced in your knowledge of the Holy Bible. When you understand the trinity of God, you will no longer be argumentative but to believe seeing that God is a Spirit, not created, but appeared, in the beginning, having no father, mother and descent neither beginning of days nor end of life (Heb 7:3). “And God said let us make man in our image after our likeness… So God created man in his own image in the image of God created he him, male and female, created he them”. When God said let us make man in our image after our likeness; who is the “us” he was referring to? Surely he was referring to Jesus and the Holy Ghost. Then it is written, “So God created ‘man’ in his own image” as of one God not three Gods. WHAT IS THE MYSTERY / SECRETS HERE? This means that when you see “one man” you have seen how “one God” looks like. “One man” is a spirit, having a soul and living in the body (1 Thess 5:23). In the same way, “One God” is a Spirit, having Jesus the word and the Holy Ghost the spirit of God. Don’t be shocked. You remember that at creation, Jesus was the word of God (John 1:1). “In the beginning was the word and the word was with God, and the word was God”. And also in the same beginning at creation, the Holy Ghost was called the Spirit of God (Gen1:2). “In the beginning, God created the Heaven and the Earth… And the Spirit of God moved upon the face of the waters”. You can see “One God” carrying his word which is Jesus, and his Spirit which is the Holy Ghost doing the work of creation. Do you understand? Just like “One Man” that is you carrying your ‘Spirit’ and your ‘soul’ going about your works. This is what the idea of trinity means – one God personality having his word and his Spirit in himself. Here you can see God release his word, you can see the Holy Ghost bring it unto the woman to form a child Jesus, the son of God? This is trinity in action. HOW DOES GOD LOOK LIKE? Somebody may be curious to ask. Jesus said in John 14:9. It is not the will of God that we should be ignorant of who he is. He is not like beasts, fowls or fishes. He is like us, the human beings, a man when he was on earth. And he said, if you have seen him, you have seen God the father. “Go you therefore and teach all nations, baptizing them in the name of the father, and of the son; and of the Holy Ghost”. In today’s work of God, you can see the division of labour among them in 1 Cor 12:4-6, Holy Ghost in charge of the gifts to do work of God; Jesus as the administrator of these gifts, that is the ways these works can be best done, and God the father is in charge of operations; that is final results of the works called miracles. So the trinity of God is still at work today; bringing salvation; healing favours, wisdom, knowledge; understanding of spiritual things of God upon human beings today; according to God’s multitude of his mercies, grace and faith. You know this today and you shall have no excuse.